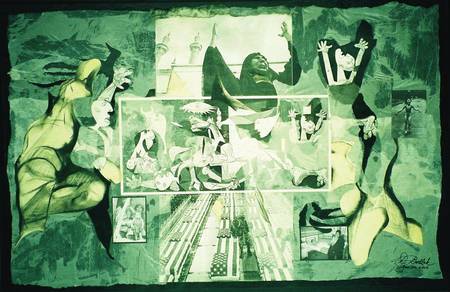 David's "Guernica and Other Coverups"
Protest painting done by Bodlak in response to the covering-up of Picasso's work on the occassion of Powell's presentation at the UN in 2003 for the lead up to war in Iraq. Artist David Bodlak expresses his horror at the way the tapestry of Picasso's anti-war painting,Guernica, was covered up so that it wouldn't detract from US Secretary of State Colin Powell's efforts to convince people to GO TO WAR. The figures in the work seem to be tearing at a covering cloth, trying to pull it down as they express their anguish.